Summary: There are some hard-won tricks to the trade when it comes to conducting successful digital marketing campaigns. We share some tips from fellow community bankers. A Bankrate survey asked people why they found it difficult to save more money. Expenses ranked first at 39%, followed by job isn't good enough (16%), haven't gotten to it (16%), debt (13%), don't know (7%), don't need to save more (6%) and other (3%). As you think about how to leverage the above information to capture more customers, build deposits or help existing customers, we zero in on digital marketing today. Certainly, there are some hard-won tricks to the trade when it comes to conducting successful digital marketing campaigns. More specifically, we share perspectives from community bankers who gave their views at a conference earlier in the year. One community banker from AR says it's paramount that marketers have ready access to the customer data necessary to conduct digital campaigns. This is particularly true if the marketing messages are to be targeted to specific customers. That means the marketing staff either owns the systems with these capabilities or has the ability to collaborate effectively with the bank's IT staff. Another community banker from LA said the budget for digital campaigns needs to reflect the extent to which a bank's customers and potential customers use mobile apps, online banking and surf the internet. Obviously, if a bank is targeting millennials in an urban area, the percentage of the budget for digital marketing may be much higher than the percentage allotted for traditional ads in newspapers, TV spots and direct mailers. Alternatively, a bank in a predominately rural market with a mostly older clientele will likely have those budgeting allotments reversed. Other digital marketing smart tips bankers surfaced include: geofencing (providing offers through GPS detection) and retargeting to appeal to a bank's target audience (such as news sites for baby boomers or social media sites for millennials). It's important to determine the right key performance indicators as well, so you can measure the success of any digital marketing campaign. But not all messaging can be directly translated into higher sales of a particular product, so other metrics can be used to measure an increase in brand awareness. This can include website behavior, measured by page views per visit and time spent on the website. Banks should also track "bounce rates" when people click digital messaging to land on the bank's site, only to then immediately hit the "back" button. That can be a strong indicator that the messaging might be off-target. For a VA community banker, the most critical component of a digital marketing campaign continues to be relevant content. If a bank caters to specific niches, such as women business owners or nonprofits, it pays to provide content that the target audience might especially appreciate. They will then likely promote the bank on social media or their own blogs too. For broader messaging across a bank's entire customer base, digital content should include practical tips on financial matters and clear explanations on how the bank can solve pressing financial needs. The key is to be real and empathetic. Take the time to develop a smart digital marketing strategy that fits your particular bank model and customer base, and it could pay off in a very big way over time. The IMF reported that recent data shows the cost of cybercrimes globally has climbed to between $250B and $1T. The intricacy and scope of these bad deeds has also increased, which makes them even more challenging to conquer. S&P Global Market Intelligence projects deposit costs will increase to a greater degree in 2019 as banks try to attract more deposits, despite a pause in interest rate hikes by the Fed. The industry's cost of interest-bearing deposits rose to 0.81% in 2018 from 0.49% in 2017. Deposit betas jumped to 42% from 19.6% in 2017 and 12.2% in 2016. A UBS study finds the biggest banks have the following technology spending budgets for this year: JPMorgan ($11B); Bank of America ($10B); Wells Fargo ($9B) and Citigroup ($8B). 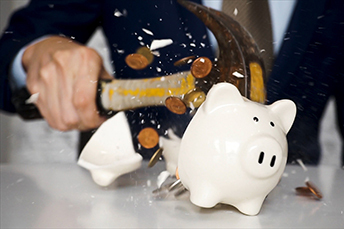 At these levels, larger banks are spending about 0.4% to 0.5% of assets vs. about 0.2% for banks $500mm to $50B in assets, according to other research by Cornerstone Advisors.